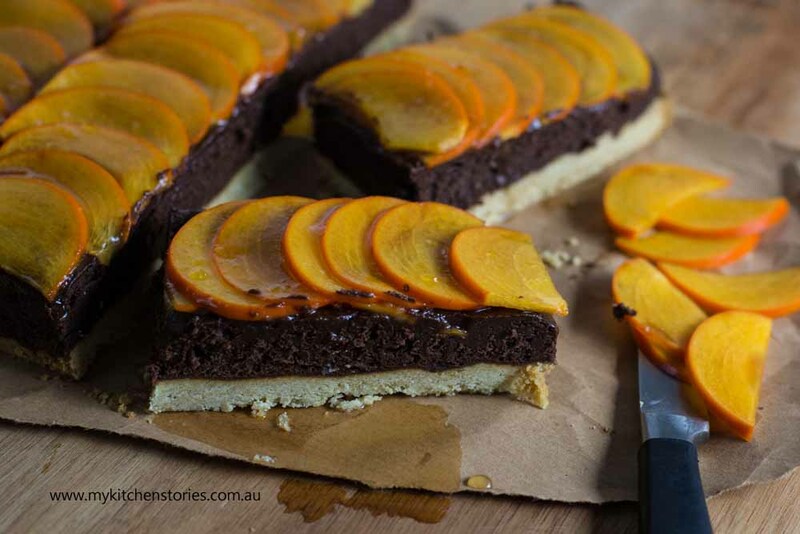 I love this Persimmon Chocolate Mousse Tart. I love it mostly for the Persimmons on top. They make any dessert a treat and they never go brown! There is no skimping on the chocolate for this tart. Once you make it you’ll be hooked. I’ve played around with a bit of a classic that I make because I figured you could give this incredible chocolate mousse filling a bit of a try with out having to make shortcrust pastry. Well I am not trying to discourage you from making pastry, in fact the recipe is here if you’d like to try that. What I thought I might do though is give you this stir together and bake base so it is quicker for you. Its kind of like steeling from Peter to pay Paul but all I want is for you to try this filling. I am serious it is the best. There are chocolate tarts where you melt chocolate with cream and pour that into a tart case and , yes that is even easier BUT it doesn’t taste anything as magical as this filling and you absolutely need to try it. A chocolate ganache tart is much heavier than this filling will ever be. mmm. So give this simple version a bit of a go. It can take a persimmon tree up to 7 years before it produces fruit. Persimmon trees can reach 70 feet tall. There are about 2,000 varieties of persimmons. There are only 2 types of commercially available persimmons: hachiya and fuyu. Persimmons are full of tannin, and in Japan this is used to brew sake and also preserve wood. The small, non-edible fruit from wild persimmon trees in Japan are crushed and mixed with water. This solution is painted on paper to repel insects. This solution is also thought to give cloth moisture-repellent properties. Cool hmmm? I have found a variety of ways to use them, none of which include instruments or wood! 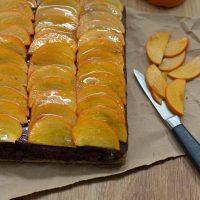 I was supplied with a tray of them from Persimmons Australia and I predominantly just ate them as they are plain and simple and with other fruit for breakfast. The beauty of these is that they can be sliced or cut and they don’t go brown or spoil. Cut it up….eat it later. 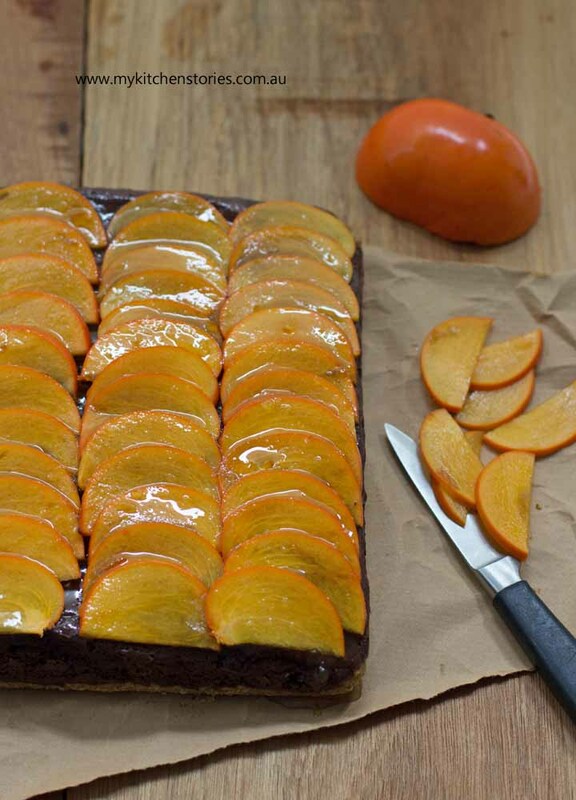 This is a luxurious tart that is so beautiful with sliced persimmons on top. The pastry is an easy push into the tin and bake type. Australian cups are used. Put the flour and brown sugar into a food processor and whizz to combine. Add the melted butter and process till just combined. Tip in to the tin and push over the bottom. Chill for 5 minutes before baking till golden . You can also mix this in a bowl by hand Approximately 15 minutes. Melt the butter and chocolate together and stand aside. Use a mixer or hand mixer to beat the 4 eggs till light and white and fluffy. Once they are ready fold the eggs through the butter chocolate mix by hand. Pour over the baked base and return to the oven for 15- 20 minutes. The chocolate should be set on top but still soft and giving to touch. If it is very wobbly bake at 5 minute intervals for another 5-10 minutes. Cool and chill. Remove from the fridge 1/2 hour before you eat it. Or eat it straight from the oven. Before eating paint gently with apricot jam mixed with 1-2 tablespoons of hot water. 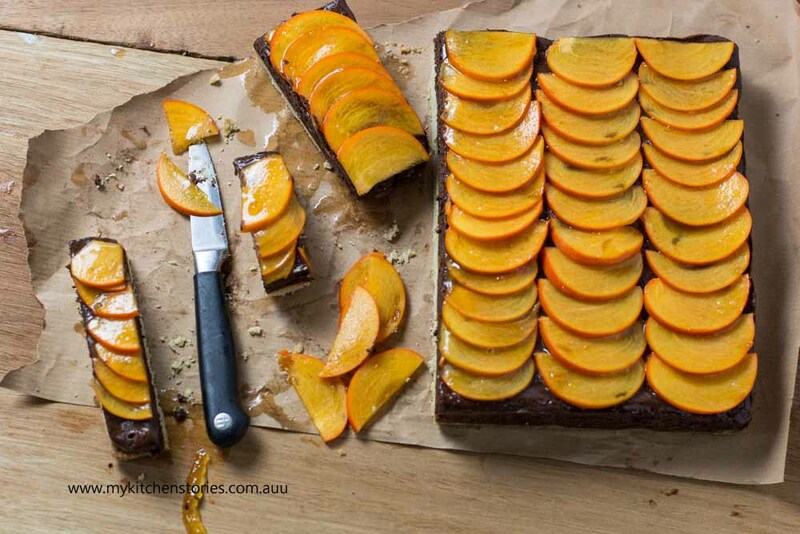 Slice the persimmon and decorate the top. Make sure you fold the butter and chocolate through just like making a mousse.